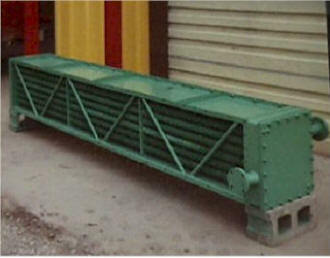 Various types and sizes of the large heat exchangers we service. We have been repairing industrial heat exchangers for many years including U-bends, shell & tube bundles, oil coolers, chiller units, non-freeze units, condensing coils, steam coils, evaporator coils. We can clean, test, repair, and even retube any size heat exchangers. Our technology allows us to be able to clean out even the most plugged up heat exchangers. Initial clean and test allows us to get a clear picture on what type, if any, repairs need to be made. Repairing your existing unit can cut "downtime" which is costing you the customer money. Retubing gives you a "like-new" unit at a cheaper cost than new.